← Every picture tells a story. One afternoon last winter I felt a moment of panic. I was reviewing work in progress on my exhibition – Bird/land – and realised I had broken the back of it. There would soon come a time when it was complete. Now, six months later, it really is ready. Since my return from France in early May I managed to get a picture of ringed plovers at Ynyslas which, combined with four other wader images, makes a nice set of five ( a quintych, perhaps?). 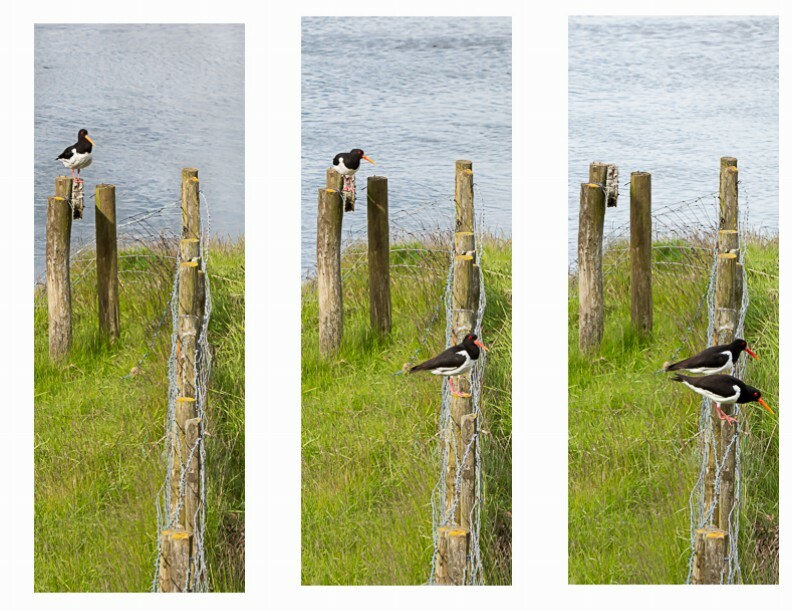 A couple of days later it was a real bonus to find a pair of oystercatchers with a nest about three yards from a hide at Ynyshir (see above). I’ve also spent many, many hours patiently checking and adjusting every image (more than 100 of them) individually. Within each of the thirty-five works the ground colour of the images need to match. So much time spent sitting at my desk when I would rather have been outside……..
Last week I went over to St Harmon near Rhayader where Andrew Jackson is printing and framing the exhibition for me. I was very happy with most of them and he kindly agreed to reprint a few which weren’t quite up to my rigourous (and probably quite arbitrary) standards. I picked them up yesterday and they will be delivered to the gallery on Monday morning in time to be hung for the exhibition opening on Saturday June 27th. For background on the project see this post. Bird/land consists of 35 works, many of them triptychs, in which birds and their surroundings are both integral to the images. Within each work, the images are linked by species, location, or aesthetic considerations, or sometimes all three. Each image is in panoramic format. There are also two single images. Subject matter extends from house sparrows at a National Trust teashop to migrant dotterel on a Welsh mountain-top. In this way Jeremy Moore explores his twin passions for wildlife and landscape in every photograph. For each work sold a donation will be made towards the reconstruction of the hides at the RSPB’s Snettisham reserve in Norfolk, which were destroyed by the storm surge in December 2013. Bird/land is at MOMA Wales, Machynlleth, Powys, from Saturday June 27th until September 19th 2015. Jeremy Moore will be giving the annual Halstatt lecture at MOMA during the Machynlleth Festival on Wednesday August 26th. Bird/land has been supported by the Arts Council of Wales. I’ve added some of the works to my website, so log into that to see them and click on the Bird/land gallery. Or click on this link . Why the panic that I experienced over the winter, then? Not happy just to get the thing over and done with? As a photographer I thrive while I am working on a specific project. It gives me the impetus to keep moving forward. In years gone by I was happy just to be exploring the world with my camera, but there’s no doubt that with age and experience that inner drive fades away. So will there be a huge gap in my life? You bet there will be. I like the format jerry, a very nice collection! I’d love to see those Starlings under the pier one day. Thanks for the comment. If you do ever decide to visit mid-Wales, you’d be welcome to stay here. But be aware, the starlings can be very unpredictable. Or rather it is predictable that will almost inevitably not give you the displays that you are hoping for!